PadJack Inc. announces a global partnership with DataTraceID, a wholly owned subsidiary of DataDot Technology and the utilization of their DataTraceSPECTRO product for the highest level of data port security. DataTraceSPECTRO is a covert “lock-and-key” taggant technology, comprising a large number of complex chemical formulations with spectral signatures in unconventional spectral ranges (the locks) and highly sophisticated detection devices (the keys). The detection device is easy to use, portable, handheld and does not require database access, providing instant on-site verification. The technology is distinguished from other covert taggant technologies by a superior detection capability that is evident in its accuracy, sensitivity and customer-specific detection windows that prove authenticity by overlaying detection intensity and wavelength channels. 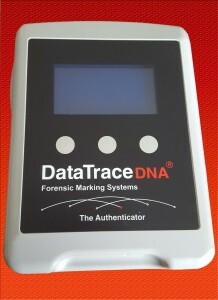 This allows DataTrace ID to offer many unique spectral fingerprints on an appropriate fit-for-purpose security level. To re-engineer the security feature, a counterfeiter would need to copy the entire production process from raw materials, the formulation of the product and the application parameters. PadJack Inc. has now partnered with DataTraceSPECTRO and can incorporate this unique “fingerprint ID” into any of our product line during manufacturing, making it one-of-a-kind to your facility. Utilizing a small handheld scanner, all of your ports with PadJack’s DataTraceSPECTRO locks can be easily swiped to verify that they are authentic to your organization. This makes for fast, easy and secure auditing of all your ports. PadJack is the only manufacturer in the port security industry to offer this type of “DNA” material, giving you the highest level of port security and auditing features.